2 Kites are to be launched towards the water, not the road AFTER careful preflighting for tangles, etc..
3 Kites are to be kept over the water when standing or walking on the beach to avoid stalling and crashing. 8 Keep the launch area open and clear for other riders, do not stand kite up blocking things. 12 BEGINNERS NOT CAPABLE OF STAYING UPWIND ARE NOT ALLOWED TO LAUNCH OR RIDE WHEN THE WIND IS ONSHORE or from SE to S to SW.
Last edited by RickI; 02-20-2008 at 11:08 AM. 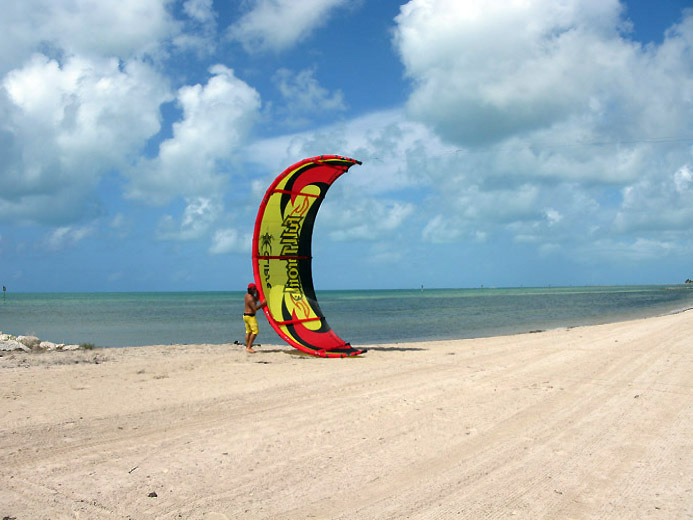 Smathers Beach on Key West, FL can be a challenging intermediate or stronger kiteboarder launching area for a variety of reasons. Some of those reasons and precautions are explored below. 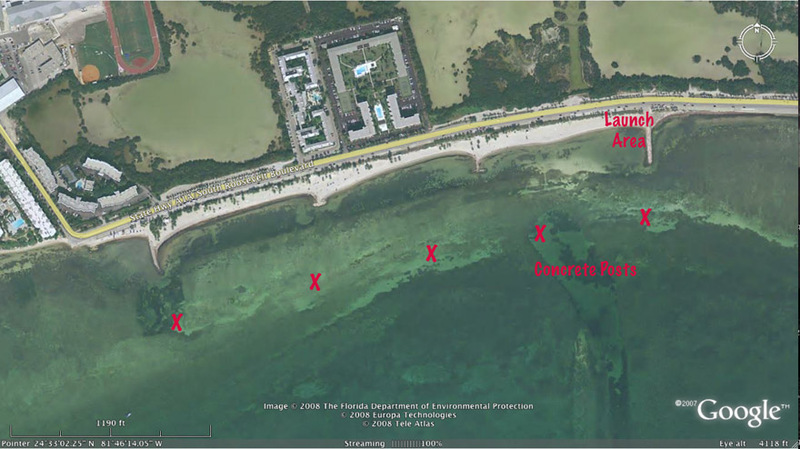 Kiter must comply with the kiteboarding rules for Smathers Beach to improve both kiter and bystander safety and to help maintain our access to this unique launch. Smathers Beach, bent due to image distortion. It actually runs close to east to west. Note the powerlines and concrete posts in the water. Note the shoreline to the east. The wind is side offshore and therefore potentially uneven with gusts and lulls with wind much to the north of East South East or to the north of West South West. If your kite is overhead while onshore in these conditions it will likely stall and fall possibly on the beach, very possibly over the powerlines. 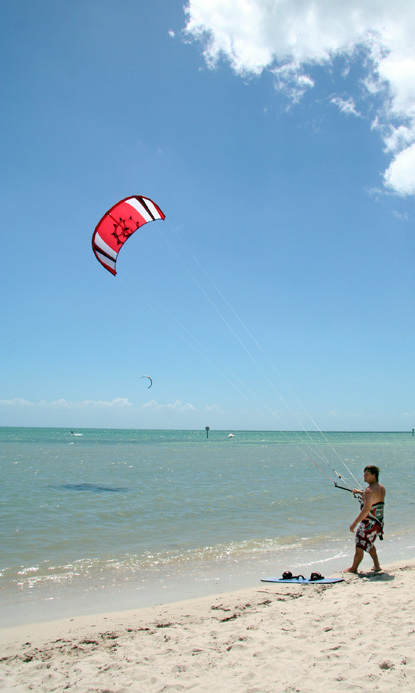 Kiters must keep their kites over the water to the south while standing onshore in such conditions. Launch with your kite closest to the water, keep it angled over the water and get into the water without delay. When landing have someone grab your kite as soon as it goes over the shore. The powerlines are very close as is the roadway and traffic. Kiters will exercise great care to make sure their kite doesn't go over either one, EVER. When launching in easterly winds, the kiter is usually advised to stand near the roadway with his kite being held for launch near the water after careful preflighting. Do not bring your kite to the zenith or vertical after launch but bring it up to about 35 degrees or less and walk to place the kite over the water and into cleaner wind without delay. Do not stand onshore with your kite overhead, ride or land but don't loiter on the beach. 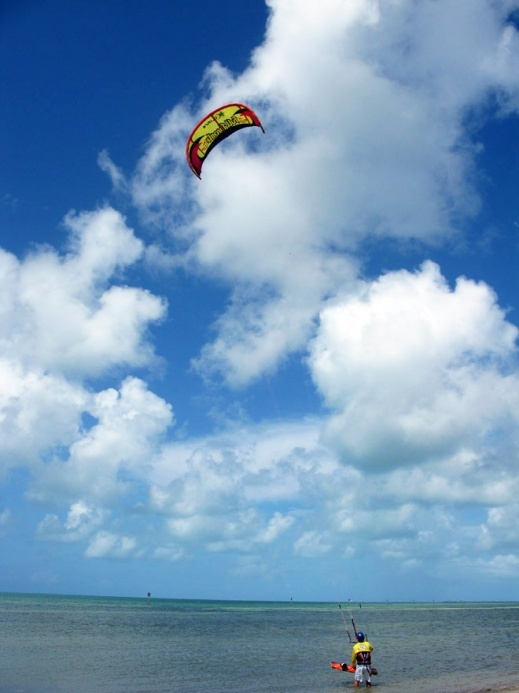 Looking west down Smathers during a permitted large kiteboarding competition. Kites on the beach are normally kept much further west. Note the kite in the distance. You want the kite over the water particularly in easterly winds. Disturbed wind over the land might drop it right onto the powerlines, so keep kites to seaward. Boards is by the water, launch with kite to seaward, keep the kite low and over the water, walk down pick up the board and go. If you need to stand on the shore for a short time, this is a way to do it. 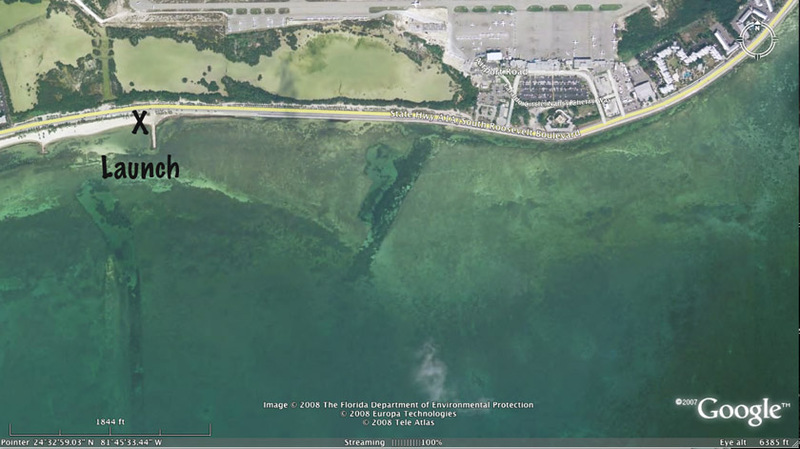 Note the concrete day marks at regular intervals about 600 ft. off the beach. 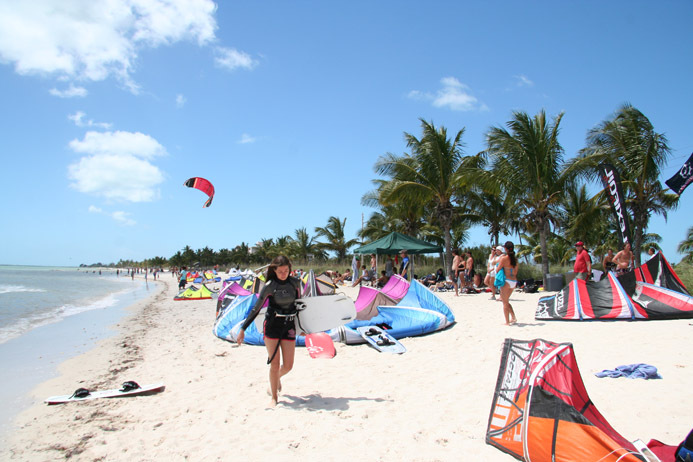 Kiters should not monopolize the calm water inside but ideally should ride through in rotation to allow fair access. DO NOT jump close to or upwind of bystanders. Do not overfly bystanders standing on the beach. * The "concrete posts" are now timber posts. Last edited by RickI; 09-10-2013 at 08:03 PM. Are the concrete posts visible above the water or are they beneath the surface of the water? At least 8 ft. above with large daymark steel signs on them. Hit the first panoramic image in the post above this one and you will be able to see them for yourself. Here a couple of shots of proper launching with East to southeast winds at Smathers demonstrated by Greg Meintjes, a long time launch regular, using his new Eclipse Full Throttle kite. He launches, keeps the kite low and over the water, walks down grabs his board and off he goes. Other approaches will likely see kites hung up over the road, in trees, over the powerlines, power killed and some really pissed off Public Officials at YOU (first) with the rest of all other kiters a close second. This can and has happened, please don't cause more problems at this unique launch by ignoring good procedures. Look at the post above this for more info. Last edited by RickI; 06-18-2008 at 11:39 PM. An update from Smathers Beach. IF YOU LAUNCH AND LAND AS IF YOU WERE AT A "NORMAL" LAUNCH YOU TOO COULD END UP IN THE POWERLINES. This is BS, this many years later that we can easily live without. First nudists now overseas kiters without a clue trying to take away kiting here. Have a care, please, read this post, understand it and DO IT! 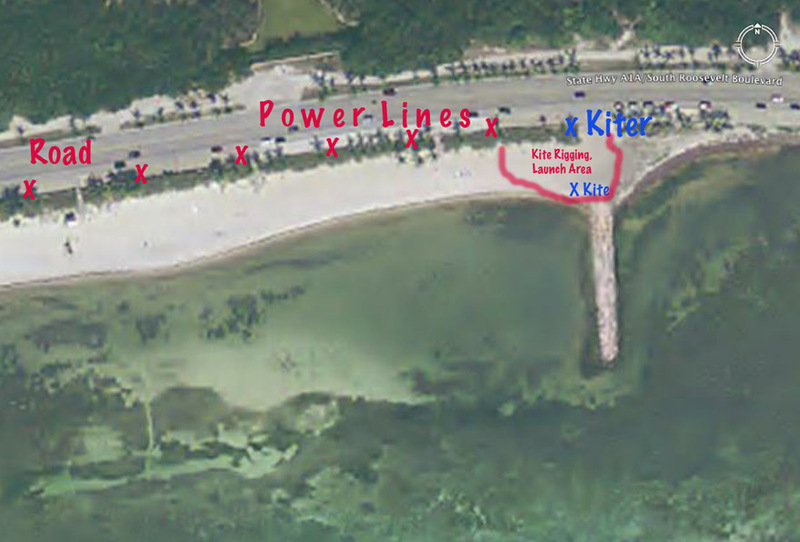 "Dear city of key west, as a kiteboarder here for over 15 years please look to excuse the tourist who put his kite in the power lines at smothers beach , he was not from here and from overseas and I am sure he enjoyed the warm welcome from the fire department and the police. 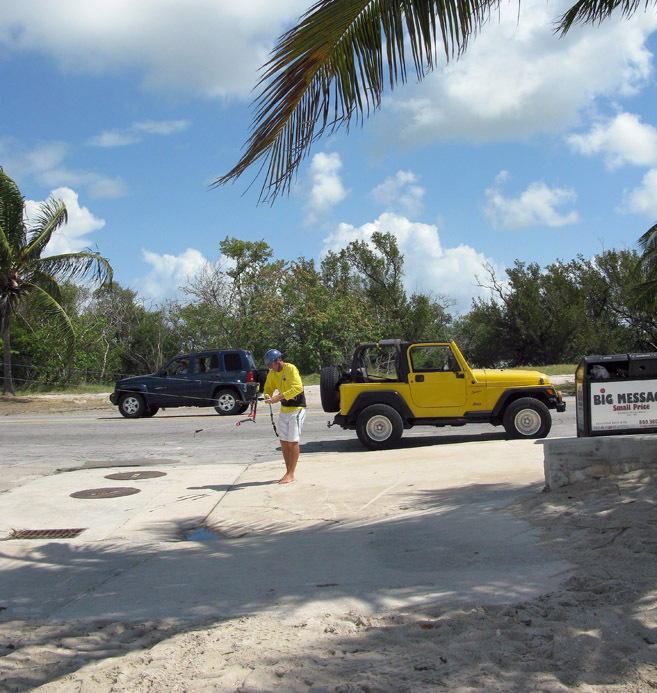 The 21 local kiters chasing him down the beach calling him and idiot I am sure got the point across."